Spray gliders are a type of autonomous underwater vehicle that were developed at WHOI and Scripps with funding from the Office of Naval Research (Sherman, et al. 2001). Sprays are designed to autonomously collect measurements in the upper kilometer of the ocean during missions typically lasting three to four months and covering 2000-3000 km through the water. Each Spray glider is about 2.3 meters (7.5 feet) in length, and has a wingspan of 1.2 meters (3.9 feet). To move vertically through the water, the gliders move oil between internal and external bladders, thereby changing the buoyancy of the glider to allow it to rise and fall. With no moveable foils, the glider controls its flight by shifting internal batteries. Moving one battery pack forwards and backwards controls pitch, allowing the glider to move forwards as it rises and falls. Moving a second battery pack side-to-side allows the glider to roll and control its heading. Spray gliders move through the water at about 0.25 m/s (~0.5 kt) horizontally and about 0.1 m/s (~0.2 kt). Schematic drawing of a Spray glider. A typical dive cycle is as follows. While rolled 90 degrees at the surface, the glider receives a GPS fix and any new commands via antennas in the wings. The glider then rolls level and begins moving oil into the internal bladder. Pitching its nose down as it sinks, the glider moves forward and steers the desired heading. 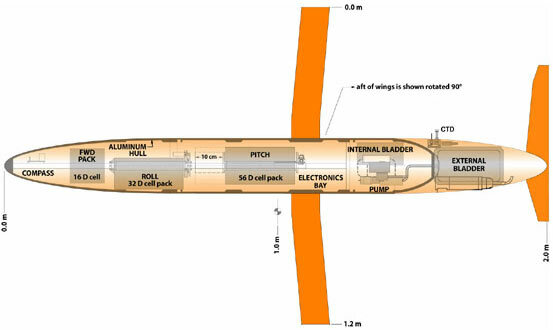 Nearing the bottom or maximum profiling depth (up to 1000 m), the glider turns on a hydraulic pump to move oil to the external bladders and become buoyant. Pitching its nose upward, the glider continues moving forward as it climbs toward the surface. Measurements are collected throughout the ascending portion of the dive cycle. Upon reaching the surface, the glider again rolls a wing up, receives a new GPS fix, transmits data via the Iridium satellite network, and then begins a new dive cycle. A dead-reckoning calculation that compares anticipated displacement from heading, pitch, and vertical speed to measured GPS displacement during a dive allows estimation of vertically averaged currents during each dive; this information can them be used to inform navigation choices on the subsequent dive. 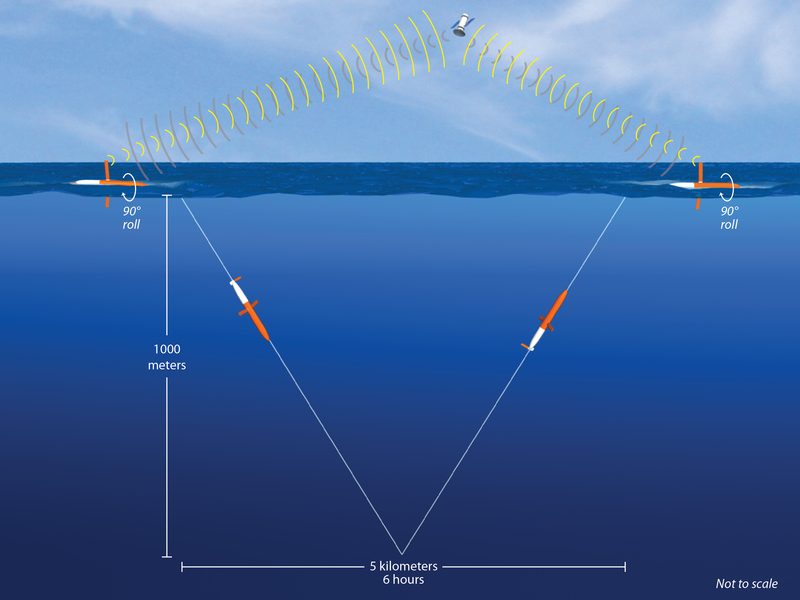 Spray gliders carry a variety of sensors to measure ocean properties. All Sprays carry a pumped conductivity-temperature-depth sensor (Seabird 41CP) to measure temperature, salinity, and pressure and to infer density. Sprays also frequently carry chlorophyll fluorometers, oxygen sensors, and acoustic Doppler current profilers.